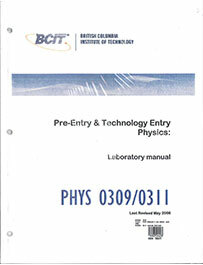 This course meets the Physics 11 entrance requirement for BCIT programs. It is the student's responsibility to determine the grade they need to meet the requirement for their desired technology. This course offers an introduction to Physics and its basic principles. Emphasis is placed on good problem solving techniques and practical applications relevant to BCIT. Topics include kinematics, dynamics, equilibrium, energy, fluids, heat, electrostatics and direct current circuits. IMPORTANT NOTE - PLEASE READ PRIOR TO REGISTERING: This course serves as an upgrade course specifically for entry into BCIT programs and is not necessarily recognized as a Grade 11 or 12 equivalent by other institutions. ** IMPORTANT INFORMATION - READ CAREFULLY AND READ IN FULL ** Class will not be held on Monday, August 5th (BC Day; Institute closed). Canadian Citizens and Permanent Residents are exempt from payment of the TUITION portion ($671.06) of this course. If you are registering through the online system and are exempt from payment of the TUITION portion, your account will be adjusted within 2 business days after registration. ANCILLARY fees such as the Student Association fee, the BCIT Student ID Card fee, etc. WILL BE CHARGED to ALL students and MUST BE PAID by ALL students. Students need to log into their my.bcit.ca account no later than 2 business days after registration to make payment for the ANCILLARY fees. THIS PAYMENT IS REQUIRED TO SECURE A SEAT IN THE COURSE. Non-payment within the specified time period will result in the student being dropped from the course without prior notification therefore it is the STUDENT's responsibility to ensure that any fees owing are paid on time. This course has limited seat capacity and seat availability is on a first-come first-serve basis. Students must be formally registered in the course to be able to attend classes. Any student who is not formally registered when the course begins at 1:00pm on Wednesday, July 10th will not be permitted to late register and attend classes without the course Instructor's written (email) approval to the student AND to the Physics department. Once the course is full there will be no over-capacity registration allowed and the Physics department DOES NOT maintain a waitlist. Any student who withdraws from the course AFTER it has begun will not be permitted to re-register and re-join the class this pts 201920 term. This course will be offered again in the Fall 201930 term starting in early September with classes held Tuesday and Thursday evenings. Visit the BCIT Part-Time Studies Key Registration Dates webpage for course registration information. 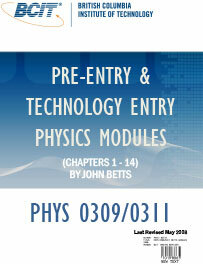 PHYS 0309 is not available as an online course at BCIT.